Add acupuncture therapy to treat your diabetes mellitus to enhance effectiveness of whole treatment. Diabetic neuropathy which has no effective treatment by conventional methods can effectively be treated by acupuncture. 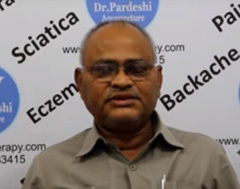 Take advantage of expert opinion of MD doctor with 40 years of experience in modern 4.5 star clinics of Nashik. No drugs or its side effects. 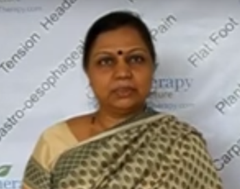 Dr Pardeshi Acupuncture therapy has been proving facilities for diabetes treatment and diabetic neuralgia treatment for many years. Diabetic Neuropathy Symptoms in peripheral neuropathy, there can be numbness, tingling of feet or lower legs, pain or burning sensation, loss of sensation in feet in lower legs. Sometimes symptoms can occur in hand or arms. Proximal neuropathy shows pain in one side of buttock thigh or hip and also weakness of leg. Autonomic neuropathy patients complain of nausea, vomiting, diarrhoea, dizziness, fainting, feeling full after small meal, difficulty swallowing and erectile dysfunction. Localised neuropathy can show chest pain, eye pain vision changes, facial palsy or pain at localised part of body. Diabetic neuropath symptoms depend upon types of neuropathy and patient himself. Diabetic neuropathy causes damage to nerves due to elevated blood sugar of badly controlled diabetes. It affects different parts of body and can be mild to very severe conditions. It can affect peripheral nerves of feet and hand or proximal nerves like buttocks, thighs and hips or local at some specific part. Diabetic neuropathy foot is common form of neuropathy. Diabetic Neuropathy diagnosis Diagnosis of diabetic neuropathy is clinical. Nerve study can be done in specific conditions. Half of all diabetic patients have some or other form of neuropathy. "Our pilot study has shown that the effects of acupuncture treatment on subjective symptoms as well as other measures of nerve function provide evidence that acupuncture, a form of alternative medicine, may be clinically useful for the radical treatment of DPN. As mentioned above, acupuncture treatment not only improved nerve conduction velocity decreased by DPN, but also improved a variety of subjective symptoms associated with this progressive disabling disorder. Further studies with larger patient numbers are required to confirm our findings, to determine whether the effects are sustained, and to ascertain whether there are any effects on other sensory symptoms associated with DPN." Diabetic neuropathy prognosis is good with proper treatment including acupuncture. It can result into diabetic neuropathy cure provided appropriate measures are taken for sugar control. You should eat small, frequent meals and avoid fatty foods. It may help those with autonomic diabetic neuropathy. To avoid orthostatic hypotension, one should take erect position slowly. Best way to prevent diabetic neuropathy is keeping diabetes in perfect control. In addition regular exercises, healthy diet and prevention of smoking can prevent diabetic neuropathy and long term complications. Diabetes Mellitus may presents with increase thirst, dry mouth, and frequent urination, weak, tired feelings are common type 2 diabetes symptoms. Latter stages of diabetes may result into blurred vision, numbness or tingling in the hands or feet. Increased hunger is unexplained weight loss, dry and itchy skin slow-healing sores or cuts, and frequent yeast infections are also important one of the diabetes symptoms. 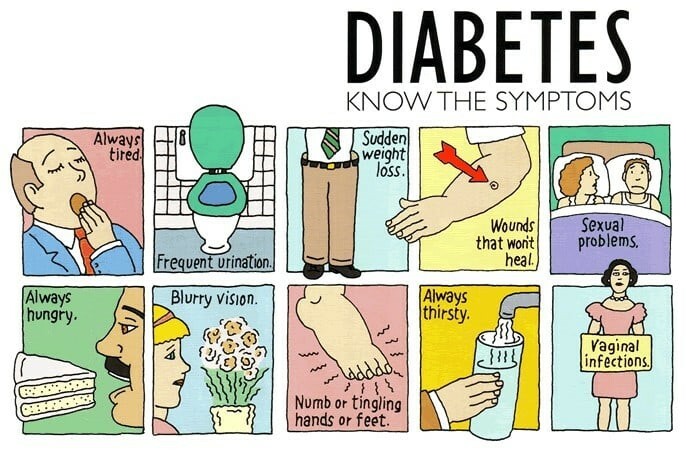 Signs and symptoms of diabetes that bring patients to doctors are sometimes non healing wound. Diabetes symptoms in women can be vaginal white discharge. Signs of diabetes in women can also be fungal infection at groin. Losses of libido can first signs of diabetes in men. Diabetes mellitus is a disease that interferes with utilising sugar from your blood causing higher blood sugar levels. This can be due to deficient insulin from pancreas, which raises glucose levels or resistance of body tissue to use insulin resulting into high blood sugar. Causes of diabetes are not known. Following factors may be associated with diabetes - family history, obesity, stress, medications, and injury to pancreas, hypertension, advanced age and high birth weight. These factors can be considered as pre-diabetes conditions. Sugar itself does not cause diabetes. Diabetes Diagnosis Fasting blood sugar test or A1C diabetes test are generally performed. - type diabetes - in this type pancreas is not able to produce enough or any insulin and seen in under 30 years of age. - type diabetes insulin is not enough or there is resistance to existing insulin. It is seen in age above 40 years and above. Gestational diabetes is condition of high blood sugar during pregnancy. Diabetes management is multifocal approach. Diabetes treatment goals should be to maintain blood sugar to normal range. Maintaining cholesterol level to normal is also part of type 2 diabetes treatments. Treatment of diabetes includes control of blood pressure. Diabetes treatment plan must decrease development of diabetes related health problems. Diabetes treatment recommendations include diet control and exercise. Diabetes treatment centre should ensure proper implementation of diabetes medications. Diabetes treatment drugs should be prescribed only to supplement lifestyle changes not as their substitute. Diet for diabetes is most important part of management. Basic need of type 1 diabetes treatments is insulin. Diabetes treatment cost due to diabetes medicine may sometimes be prohibitive therefore whole person has to be taken into consideration and practical administration of management advices. Main activity of diabetes treatment at home is diet and exercise including stress free life style. There are many treatment possibility patients are offered under banner of diabetes treatment natural, diabetes treatment in Ayurveda, diabetes treatment in homeopathy diabetes, diabetes treatment by Rajiv dixit in Hindi; but basic facts remain life style and following plan as described above. Diabetes treatment information in Urdu and diabetes treatment in Hindi languages is sought in Northern part of India. There is no cure for diabetes or type 1 diabetes cure but it can be treated and controlled. Therefore reversing diabetes is not possible but can be controlled. Most people can live normal life with proper management. Patients report having taken Ayurvedic treatment for diabetes mellitus and reported some relief also. Similarly, Homeopathic treatment for Diabetes Mellitus pain has also had some satisfied patients. Stress and sedentary life are some of few predisposing factor diabetes. Yoga treatment for Diabetes Mellitus, especially due hormonal causes can be effective. Similarly Tai Chi treatment for Diabetes Mellitus is effective. Qigong treatment for Diabetes Mellitus needs special training and can be useful tool of management. Acupressure treatment for Diabetes Mellitus has limited scope. How to prevent diabetes? Considering unknown causes, it cannot be totally prevented, but it can be postponed or managed well with available resources. Acupuncture is excellent adjuvant to treatment of diabetes. It improves quality of life and helps body cope with metabolic disturbances. It also helps reduce blood sugar level and reduces dose of anti-diabetic drugs. Many scientific studies have been conducted regarding role of acupuncture in diabetes treatment. Few of the studies are mentioned below. Practice Pearls Acupuncture is one of the oldest healing practices and is recognized by the National Institute of Health and the World Health Organization.